There’s nothing quite like a fresh haircut to make you feel like you’re killing it, is there? I finally took the plunge and chopped off the ombré I had been growing out for just over eighteen months. 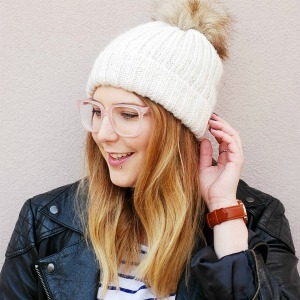 When the bleached ends got crunchy and the hair at the back of my head started tangling so easily that I had to carry a hairbrush in my handbag wherever I went, I knew it was time to cut off a few inches. I feel like a brand new person — light, healthy, and…yes, slightly nostalgic for my long mermaid hair. I’ll miss my blonde ombré locks, but bleached hair is incredibly hard to care for. I’ve been exceptionally lazy when it comes to my haircare routine over the past few months, and I had the split ends to prove it. I stopped using purple shampoo and let the brassy tones set in, and I stopped masking long enough to let my hair and scalp get dehydrated beyond repair. The one thing that allowed me to get away with it for so long? A really great shampoo and conditioner set from Maui Moisture, a drugstore-priced brand that launched in Canada just last year. I’ve been using the Maui Moisture Strength & Anti-Breakage Agave range* for a few months on and off since receiving it (the testing was put on hold for several months after I developed stress-induced alopecia last year), and I’m finally ready to tell you all about my new go-to drugstore shampoo and conditioner set. If you’ve been looking for an affordable but ‘clean’ alternative to expensive salon products, this is it. First (after all I always, always judge a shampoo by its fragrance), the scent is absolutely delightful. If you’re over winter and in need of a tropical getaway, there’s no cheaper way to escape to paradise. A hot shower and a quick wash with the Maui Moisture Agave range is almost as relaxing as a week on a deserted island. The rich agave nectar, velvety hibiscus oil and fresh pineapple extract blend together perfectly to create a sweet tropical cocktail. The scent hangs in the shower like a cloud, and it lasts on the hair for hours after you step out of the shower. Is This The Best Affordable Haircare Brand? The Maui Moisture Agave range includes a shampoo, a conditioner, and a mask. The Maui Moisture Agave shampoo* ($7.97 at Walmart) and the Maui Moisture Agave conditioner* ($7.97 at Walmart) are lightweight and hydrating, and they leave my hair feeling squeaky clean, strong, and completely weightless. Though nothing can repair the damage caused by bleach, it really helped take care of the crunchy, dry split ends while I was growing out my ombré. I was able to get away with taking minimal care of my hair whenever I used it. I would especially recommend including the conditioner in your routine if you suffer from dry, brittle hair. 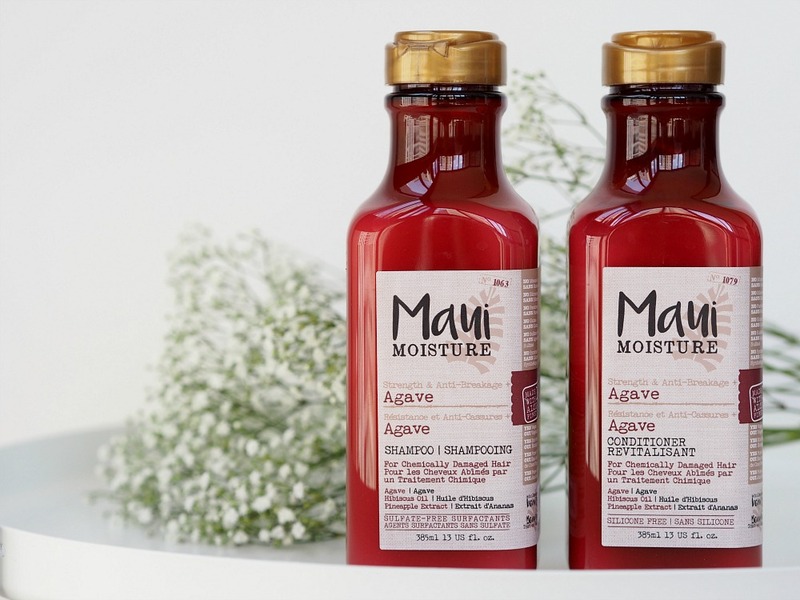 My scalp is never dry when I wash my hair with the Maui Moisture Agave shampoo and conditioner, and that alone is enough to make this range worth looking into. I haven’t tried the mask from this range, but I’m willing to bet it’s exceptional and smells good enough to eat too. Add the Kate Middleton-worthy shine it gives the hair to the mix, and there you have it — Maui Moisture is the best drugstore haircare brand available in Canada. The formula is unique because its base is infused with aloe vera juice and coconut water instead of pure water, which gives the hair moisture and shine. 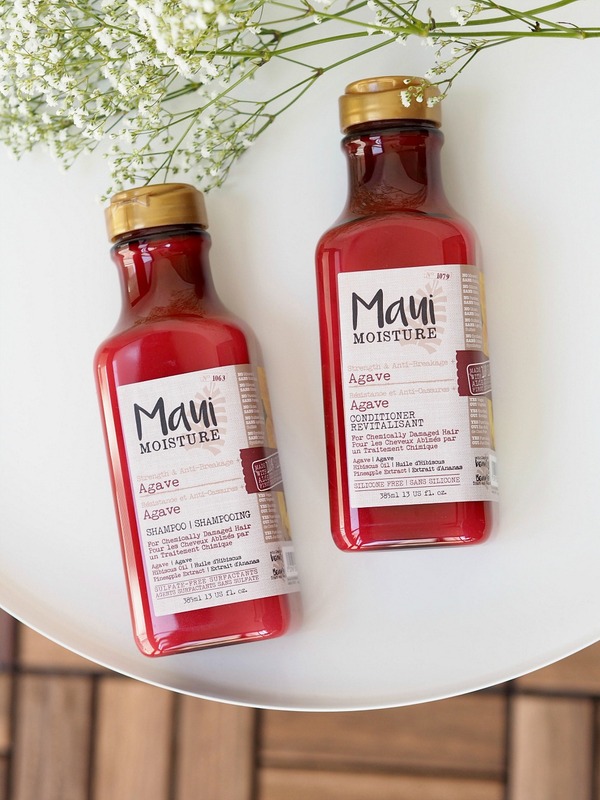 The Maui Moisture shampoos, conditioners, and masks across all five ranges are vegan and never tested on animals, and they’re free of silicones, parabens, sulfates, mineral oil, synthetic dye, and gluten. There are five different ranges available for different hair types: Strength & Anti-Breakage with Agave (this post’s star), Nourish & Moisture with Coconut Milk, Heal & Hydrate with Shea Butter, Curl Quench with Coconut Oil, and Thicken & Restore with Bamboo Fibers. There’s something for everyone, and it’s fairly easy to pick the one that’s right for you according to the names. As for the packaging, it’s made with recycled materials and it’s as eco-friendly as a mass-produced product can be. The coloured bottles are sturdy and don’t leak in the shower, and each range gets its own easy to recognize pretty colour. Even after months in the shower, the bottles show no sign of wear and tear. It’s already on my repurchase list, though I will probably opt for the Nourish & Moisture Coconut Milk collection next time since my hair feels so healthy and light now that it’s newly cut. I keep going back to Maui Moisture for a reason – it’s the best drugstore shampoo and conditioner set I’ve ever tried, and the tropical scent alone makes it a worthy purchase. Will you be trying it out?